Biophysicists have developed a method for modifying the surface of micro- and nanoparticles—tiny structures measuring between a thousandth and a millionth of a millimeter —by covering them with biological molecules. Engineered in this way, the particles can serve as both therapeutic and diagnostic agents, delivering drugs to cancer cells. The paper was published in the journal ACS Applied Materials & Interfaces. Its authors are researchers from the Moscow Institute of Physics and Technology (MIPT), the Institute of Bioorganic Chemistry of the Russian Academy of Sciences (IBCh RAS), National Research Nuclear University MEPhI, Sechenov University, and Macquarie University (Australia). Around 1900, Paul Ehrlich, the winner of the 1908 Nobel Prize in physiology or medicine, envisioned drugs that would have a component that recognizes pathogens in the body and another component that acts on the target. Usually, such drugs target receptors on the surface of the damaged cells. These receptors also allow the agent to recognize the cell. A universal system of this kind can be used for diagnostics, therapy, or both. When therapy and diagnostics are combined, this is known as theranostics. To make a system incorporating a therapeutic and a diagnostic component, a "molecular glue" is needed for holding the two parts together. This glue can be realized as proteins capable of forming a stable complex by binding to each other. One of the most stable complexes of this kind is the barnase-barstar protein pair. There is a value known as the binding constant that characterizes how strongly the molecules in a complex are coupled. The binding constant of the barnase-barstar complex is 1,000 to 1 million times greater than those of the antigen-antibody complexes, which are the basis of our immune response. Barnase and barstar can be used to engineer various functional modules for theranostics. For example, barnase can be bound to therapeutic agents—antibodies, drugs, fluorescent molecules, etc.—while barstar can be fused with a targeting agent. This concept was suggested by Sergey Deyev, the head of Molecular Immunology Laboratory of IBCh RAS. The two modules are then combined, forming a bifunctional compound, which has therapeutic and diagnostic properties, and enables targeted drug delivery. By fusing barnase and barstar with various therapeutic and diagnostic molecules, researchers can develop a range of theranostic agents based on the same principle. These molecular structures can be carried on the surface of nano- or microparticles. The particles themselves can have auxiliary properties, including fluorescence or the ability to be destroyed when exposed to radiation, killing off the surrounding harmful cells, such as cancer cells. Dozens of molecular structures of different types can be deposited on a tiny particle, potentially increasing its therapeutic effects. The notion of using nano- and microparticles to deliver drugs is being actively researched in many laboratories. The Russian and Australian researchers developed a nanoparticle-based theranostic agent using the barnase-barstar protein complex and studied its properties. "Most of the currently used methods for chemically coupling biomolecules to nanoparticles have serious flaws," says lead author Victoria Shipunova, a researcher at MIPT's Nanobiotechnology Lab and a senior researcher at the Molecular Immunology Lab of the Institute of Bioorganic Chemistry. "The spatial orientation of the biomolecules is poorly controlled, and they encounter problems when binding to their targets. The density of the coupled molecules is fairly low, and the procedure is time-consuming." "We developed a method based on the barnase-barstar protein pair that does not alter the spatial structure of the targeting molecules. Two further advantages are its high specificity and rapid coupling: It only takes several minutes for all modules to bind," she explains. The researchers used silicon dioxide-coated particles as the carriers for their molecular complex. The primary targets of the biostructures described in the paper are cancer cells, identifiable by the HER2/neu oncomarker on their surface, shown as a red outgrowth in figure 2. HER2/neu is a protein responsible for cell growth and division and present in healthy cells. 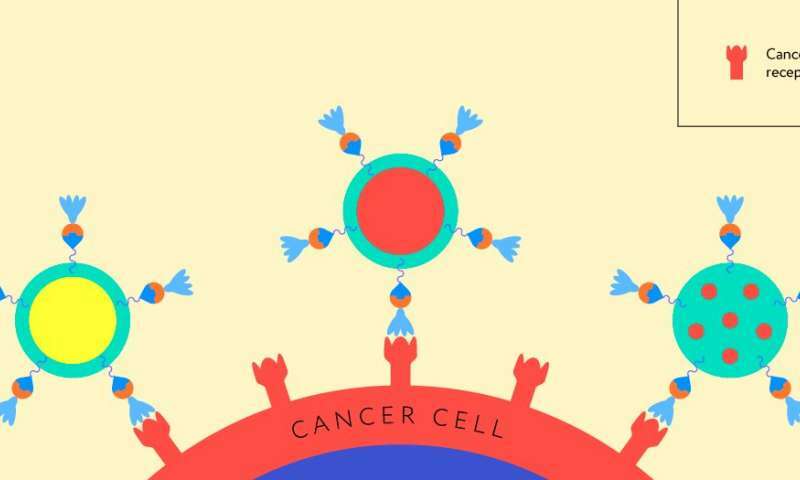 In cancer cells, however, this protein is in excess—or overexpressed—enabling them to grow and divide uncontrollably. The researchers used a molecule from the class of designed ankyrin repeat proteins, or DARPins, as the targeting agent recognizing the HER2/neu protein. Shown as light blue bellflower-shaped structures in figures 1 and 2, DARPins are small and highly stable proteins capable of selectively binding to the target molecule. 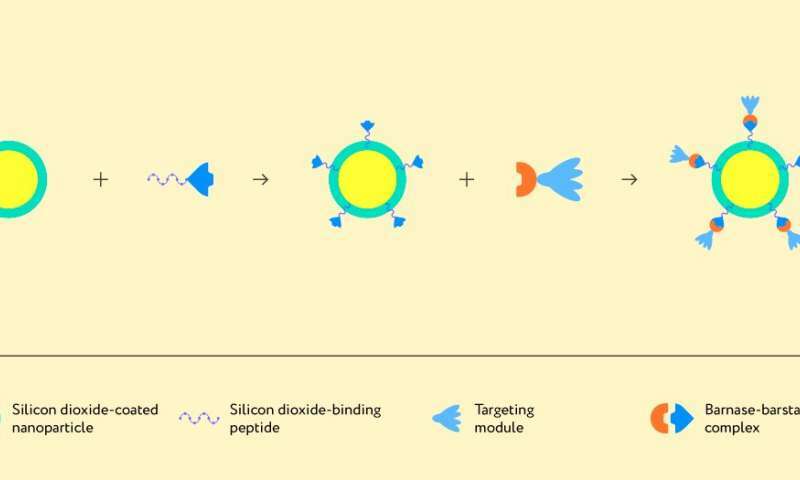 Besides a DARPin molecule, which recognizes cancer cells, the structure needs to incorporate a molecule capable of binding to the carrier particle's surface—that is, to silicon dioxide. For this, the researchers used a silicon dioxide-binding peptide obtained by rational design at Macquarie University. As a result, they created the following structure: A nano- or microparticle is coated with silicon dioxide, to which the barnase-DARPin module is attached via the silicon dioxide-binding peptide fused with barstar (figure 1). Importantly, each of the elements involved can be altered or even replaced, modifying the properties of the overall structure. In a way, it is similar to a molecular kit of building blocks, which can be assembled in many ways, producing different therapeutic agents. In effect, the researchers have created a universal assembly method, which allows a number of molecules with therapeutic and diagnostic potential to be easily combined, while preserving their spatial structure and properties.